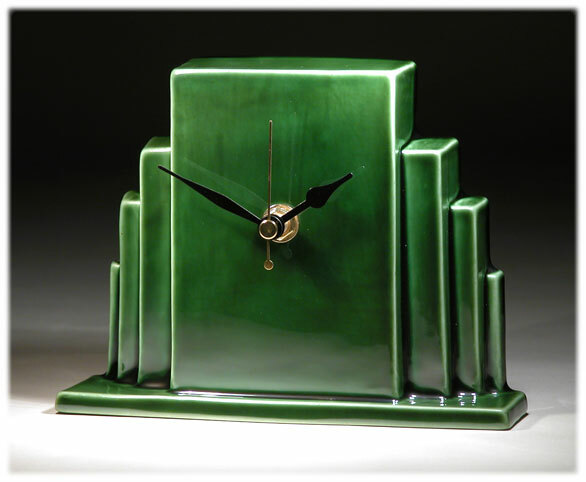 The idea for this distinctive timepiece comes from the Art Deco architecture of the Rockefeller centre in New York. John D Rockefeller was a American industrialist who played a prominent role in the early oil industry, and for a time was the richest man alive. In today's terms Rockefeller would be worth at least twice as much as Bill Gates, Warren Buffett and Sam Walton's fortunes combined. Rockefeller spent much of the second half of his life focusing on philanthropic pursuits, primarily relating to education and public health, eventually giving away about half of his wealth. This piece has been finished in Echo Of Deco's own 'Racing Green' glaze, but is also available in many of the studio's other unique glaze colours.